Paul Blenkiron is a Consultant Psychiatrist based at Bootham Park Hospital in York, UK, and is an accredited member of the British Association for Behavioural and Cognitive Psychotherapies. He is also Honorary Senior Lecturer in Psychiatry and Behavioural Sciences at Leeds University, and a CBT course facilitator at York University’s Department of Health Sciences. He has authored more than 60 original research and clinical publications in the areas of CBT, depression, self harm and chronic fatigue. List of Tables, Figures and Boxes. PART ONE: ONCE UPON A TIME: GETTING STARTED. 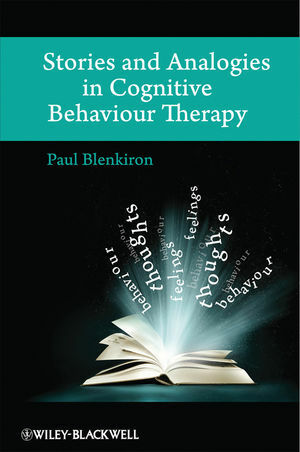 Chapter 1: What is Cognitive Behaviour Therapy? Ten Common Myths About CBT. Chapter 2: Stories, Analogies & Metaphors. Stories from the Wider World. Chapter 3: Using Stories in CBT. Uses for Stories and Metaphors. PART TWO: DEVELOPING THE PLOT: STORIES FOR SPECIFIC DISORDERS. Step 1: Putting it into Words. Step 3: Doing More - Activities and Goals. Step 4: Removing the Critical Voice. Step 5: Develop a Kinder Self-Talk. Step 6: Preparing for the Future. Chapter 5: Anxiety, Panic and Phobias. Chapter 6: Obsessions, Compulsions and Post Traumatic Stress. Stories and Analogies for PTSD. Chapter 8: Personality, Beliefs And Behaviours. PART THREE: HAPPILY EVER AFTER? STORY-TELLING IN THE REAL WORLD. Chapter 9: CBT In Practice. Creating Personalised Stories and Analogies. Teamwork, Training and CBT Supervision. Chapter 10: The Next Generation. Appendix 1: Sources of Information for this Book. Appendix 3: List of Therapy Conversations. Appendix 4: List of Stories and Analogies.